Are you ready for an adventure? 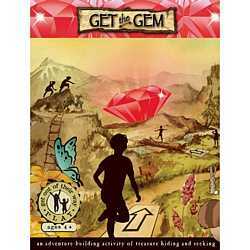 Get the Gem is a hide and seek game that comes to life with your child's imagination. One player creates a trail of arrows using the picture cards supplied, past make-believe obstacles like rushing rivers, fallen logs, and boiling mud. The other players follow that path and act out an adventure on their way that is depicted by the cards and their own imagination to find the hidden treasure.